Hundreds of law enforcement officers gathered at the Capitol Friday to honor their fallen colleagues. 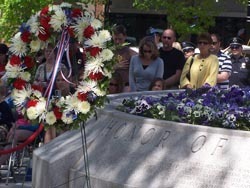 Police from across the state met at the Wisconsin Law Enforcement Memorial , where they remembered fellow officers who gave their lives in the line of duty. State Representative Ann Hraychuck , the former Sheriff of Polk County, says they may be gone, but the sacrifices of those officers will not be forgotten. She says it&apos;s the obligation of surviving officers to make sure the next generation understands what was lost while protecting the safety of the public. Two names were added to the memorial this year. The Racine Police Department&apos;s John Harms was struck and killed by a train in 1918 while responding to a call. John Sealy of the Iron County Sheriff&apos;s Office was accidentally killed by gunfire in 1906, while investigating a burglary. Governor Jim Doyle says those who have paid the ultimate price for freedom should be revered. Attorney General J.B. Van Hollen says those officers need to be honored going forward as well. Nearly 250 officers are listed on the memorial, which rests on the Capitol grounds.